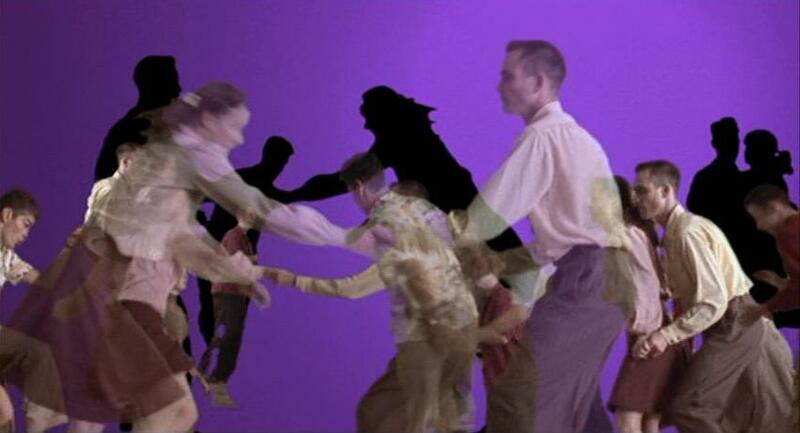 The first thing viewers of Mulholland Drive see appears as though it’s something out of a Jefferson Airplane music video: a psychedelic depiction of people dancing surrounded by purple auras of light. This scene, disconnected as it may appear, is important for understanding larger themes in the film. My comments below will not follow an orderly narrative, but that, too, is in keeping with the sequence of the film, which seeks through its presentation to destabilize the very notion of objective meaning and structure. Throughout the film there are scenes that at first glance seem too random, but upon the film’s conclusion, you realize that these scenes were foreshadowing. For example, the two men that are talking in the diner about dreams and fears ultimately show what will eventually happen to Diane. As she’s beginning to realize her worst fear, she notices one of these men. The startling hobo who appears in front of the two men represents the worst possible thing for the men: failure. Diane’s worst fear is lying dead, which we see at the end of the film when she kills herself. It is a process of her disassociating from reality through denial and coming to terms with the fact that she killed Camilla that eventually catches up to her. In part, David Lynch seems to be critiquing American perceptions of business by displaying almost “Illuminati-like” characteristics in the conspiracy behind the roles in the film they are making. This is best displayed during film director Adam Kesher’s fantasy narrative where Camilla is forced into the lead role of his film despite his fervent efforts to stop it from happening. The man who is supposed to be in complete control of the film is actually a “puppet.” Betty represents the aspiring American actress who has lost her identity in the Hollywood “machine.” But this critique is part of a much larger commentary on perceptions of reality. What Lynch really seems to be interested in is how people interpret their experiences. The entire work is flooded with people whose perceptions of reality have been altered either intentionally or unintentionally. The opening scene shows an altered state of habitual psychedelic drug use. The woman who was in the car accident, Rita, is someone whose reality is altered by amnesia which is why she becomes Camilla. Betty’s fantasy of becoming famous affected her so profoundly that she believed she was Diane, another distorted reality. The man who died after seeing his worst fear, the hobo, couldn’t differentiate reality and dreams. I would argue that David Lynch wanted to try to change the audience’s perception of reality by implicitly suggesting that everyone has, to some extent, skewed perceptions of reality. Not skewed in a malevolent way per se, but skewed by unintentional subjectivity. The film’s essence in in a way a depiction of the move from modernism to postmodernism by displaying the “tragedy” of human subjectivity, while in part showing that subjectivity is inevitable, and thus it isn’t really a tragedy. It finally hit me that this movie can be interpreted an infinite number of ways and that is exactly how David Lynch intended it to be. If this simplified the film at all for you, you’re welcome. If this further complicated it (which I almost certainly believe it has), you’re welcome. This entry was posted in Relevance of Humanities and tagged Movie Night, Mulholland Drive, REL 360, Vincent Hills by admin. Bookmark the permalink.